BBC NEWS | UK | How would road charging work? Road charging is the government's radical proposal to cut congestion, and pilot schemes are being developed. So what would it be like? A BBC experiment intends to find out. This would be the biggest single change to the way we drive since the invention of the motorway. It could change the way we think about using our cars. It would certainly mean more of us would turn to that much-loved conversation starter - "so which way did you come?" Because when and where you drive would become decisions with financial implications. Road charging puts a price, possibly per mile, on roads depending on how busy they are. This means a single-lane A-road heading into a busy city during the rush-hour is expensive to use. A quiet country lane on a Sunday is much cheaper, probably free. It is slightly different from a congestion charge, such as the system in London, which you pay if you enter a central area of a city, and then at a flat daily rate. The government likes road charging because it makes drivers face up to the true cost of road congestion. Currently the tax we pay on petrol reflects only how far we have driven, not when and where. Under one option the government is looking at, fuel duties and the tax disc would be abolished, to be replaced by universal road charges. 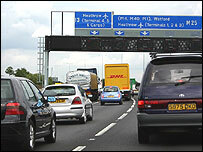 If prices are high enough it should encourage drivers not to travel unless they have to - and to avoid busy times. The result, according to supporters of charging, is the roads will be quieter and those of us prepared to pay will have easier journeys. Ministers are so keen they are even hoping to introduce wider powers to introduce charges for driving in the next session of parliament. It is quite simply THE big idea for clearing UK jams. But it is a radical, controversial idea with many unanswered questions. How do you collect the money? How much will we end up paying? And most of all, will it work? So to answer some of these questions, the BBC decided to set up its own small charging system. We're calling it Pay As You Drive. We have chosen four different drivers in the Midlands, and we have had satellite tracking equipment fitted in their cars. For a month they will go about their normal motoring lives, but every minute we will keep a record of where they have been. The prices have been set by Professor Stephen Glaister, the country's top transport economist. He has used a computer model based on government figures, to work out how much to charge to reflect the delays, accidents and pollution caused by traffic congestion. At the end of the month we will send our motorists their Pay As You Drive bill. How much will they spend in a month? The results could be a surprise to anyone who drives on the UK's jam-packed roads. Road charging of the sort we are trying out, using GPS satellite tracking, is unlikely to be introduced for at least 15 years. The technology basically works. But it would require millions of drivers to have tracking units fitted in their cars. This would probably be made voluntary, with drivers encouraged to join the scheme through financial incentives - ie, lower charges than those levied on drivers without "boxes". In 15 years' time, automatic numberplate recognition cameras are likely to be in common use on the roads. They can easily identify drivers who are using their cars without sending back tracking information. 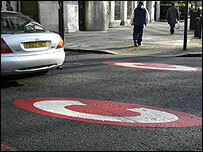 But within five years it is likely a second area of the country, such as Birmingham, will introduce a congestion charge. This would probably use more advanced technology than London and would act as a "pathfinder" road charge for a national scheme. The real barrier for any government wanting to introduce charges is the political acceptability of road charging. Drivers will have to be convinced their money will buy easier journeys, that their privacy isn't going to be breached, and above all, that the scheme is fair. All that is much easier said than done.